Most of you out there may not think of Meizu as a company known for its innovative devices — hell, most of you may not even think about Meizu at all. So far, the Chinese phone maker's offerings have looked like the epitome of the cheap, soulless black rectangle people have come to associate with the People's Republic. Sure, there's a fairly good reason for that — fly too high too fast and you'll turn into the next LeEco — but it's still funny just how same-ish all their phones have looked like in the past. It's fair to say we were surprised when we first heard whisperings of the Meizu Pro 7, the company's next flagship. Not only is this phone unique amongst Meizu devices — it's unique amongst smartphones in general, thanks to its weird but exciting standout feature, a rear-mounted second display. So to celebrate having something new and unique on the increasingly stale market, we've decided to collect all the info we've got on the device so far, and present it to you in an easily digestible format. Enjoy! Starting off with the visuals first, on the front of the Pro 7 you'll find — wait, who are we kidding? We all know why you're here, so let's turn our attention to the elephant in the room right away. You see, this phone has a tiny second screen embedded into its back, right under the camera module. And unlike the YotaPhone duo — the only existing similar products — that screen is full color, and doesn't cover the entirety of the back panel. And it turns out the display is touch-enabled as well, which should prove useful for a number of different applications: multiple leaks so far have shown it running a (bad-looking) Pac-Man knockoff, for example. But besides small-scale games, the screen can also be utilized in other ways: using it as a viewfinder while taking selfies is one example. And it appears the phone will be able to mirror everything on the front display to the back one as well, so in theory you'd be able to run anything you want on it. Also, its most obvious function — an interactive custom notification tray showing data such as the current weather and step count — will be making an appearance as well. As for the rest of the device, it looks to be pretty much standard Meizu fare: a 5.2-inch full HD screen on the front with a pill-shaped fingerprint scanner below it, and a brushed metal frame encasing the rest of the device. And just like the Pro 6 before it, the Pro 7 is said to come in two separate versions: a regular and a Plus variant, the latter of which is, as one might imagine upon hearing the name, larger in size. The previous generation of Meizu flagships, the Pro 6 and Pro 6 Plus, differed in more than just size alone: they also offered fairly different specs as well. Namely, the smaller device was powered by MediaTek's Helio X25, while its bigger sibling was equipped with Samsung's Exynos 8890 (the same chip as the one found in the international version of the Galaxy S7). This year, however, things may be about to change: rumor has it that Samsung is unwilling to sell the new Exynos 8895 to third parties, so the Pro 7 Plus may have to do with a MediaTek processor instead. In fact, MediaTek's official Weibo page has confirmed this: apparently, the smaller Pro 7 will use the mid-range helio P25, while the Pro 7 Plus will debut the high-end helio X30 instead. The Pro 7 will come in two different variants, one with 6 GB of RAM and one with 8 GB, while the Pro 7 Plus will be offered in three: a 4 GB one, a 6 GB one, and an 8 GB one. Different models will also get different amounts of storage: 64 GB or 128 GB. Another first for Meizu is the Pro 7's inclusion of a dual rear-facing camera module. It's positioned right above the rear screen in a horizontal orientation. Both sensors will be Sony's 12 MP IMX386, though we're not entirely sure whether they'll be in a color/monochrome combination, or the regular/zoomed in configuration that's been gaining steam lately (though teasers have suggested it will be the former). 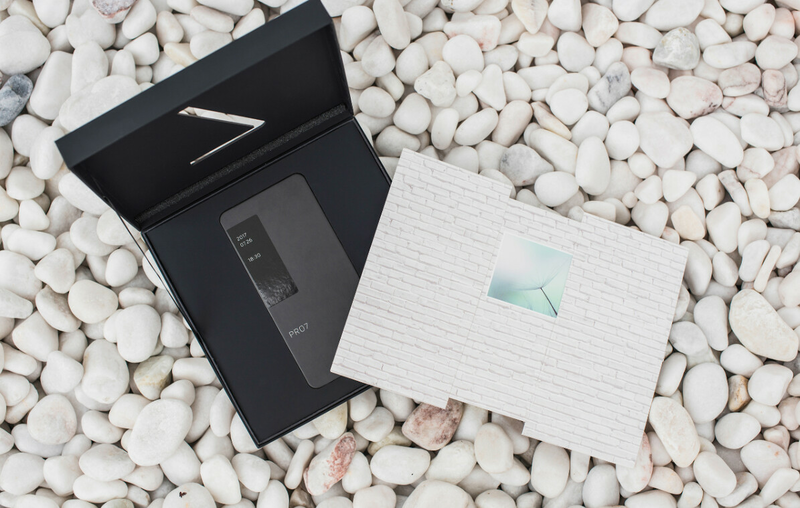 At this point even Meizu's given up on keeping the Pro 7 a secret — in fact, the official invitation for the device's launch event (shown above) features a paper cutout of the phone, complete with a second screen. Oh, and that launch? It's happening very soon: July 26, to be exact. Meizu isn't a company with much brand exposure in the West, and particularly so in the U.S., where its devices can't be gotten through any of the four major carriers. Still, we expect a stronger push westward with the Pro 7 duo (in Europe, at the very least) given its high gimmick factor, which gives it a significantly better potential to resonate with local customers. However, so far we only have pricing information for China. The smaller Pro 7 is said to start at the equivalent of $413, while the larger Pro 7 Plus will start at about $480. Meizu is anything but cheap. They have been making quality flagship phones for many years and have established a good track record. Meizu is an established company making money and building a fanbase in their homeland. No need to sell phones in the US where the market is over saturated with no growth. This article is blasphemy.